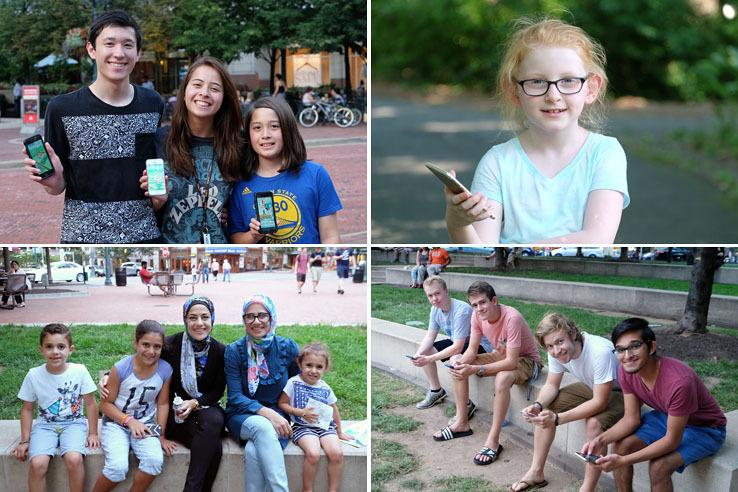 I’m sure you’ve seen them, staring at their phones while wandering around Reston Town Center, Lake Anne Plaza, and just about every other landmark in the country. Pokemon Go players seem to be gathering everywhere. This phone game was launched last week, and within a few days its daily usage has exceeded that of Twitter, Snapchat, Instagram, or Tinder. Whether or not you’re a video game person, you’ve got to admit that this is intriguing. Why are so many people hooked on this game? Who’s playing it? Has it had an impact on local businesses? I was curious, so I decided to ask. 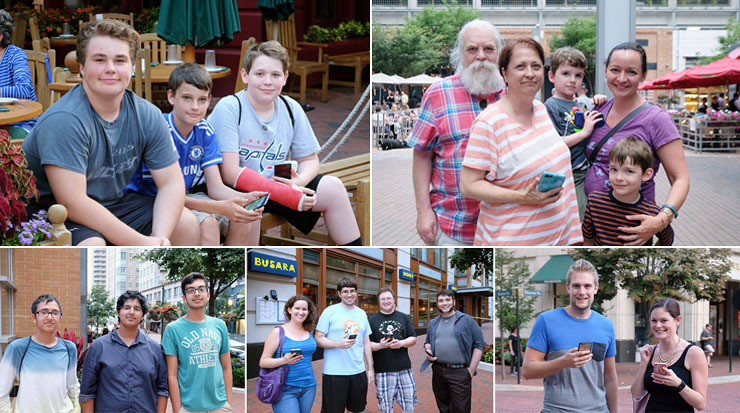 One evening this week, I walked around Reston Town Center and talked with dozens of people who were playing the game. Here’s what I observed during my highly unscientific research. People of all ages are playing it. It seemed like the most common age range of the players was early-teens to mid-twenties, but I also spoke with kindergarteners, business travelers, retirees, extended families, and more. They are playing it for nostalgia, social interaction, and/or the thrill of the hunt. Several young adults named a lifelong love of Pokemon as the reason for their interest in the game. People of all ages mentioned that they love the noncompetitive nature of the game and the way that players are socializing while playing. Perhaps the most common reason I heard about people’s love for the game is that they enjoy the scavenger hunt-style challenge of finding things hidden around town. People who would ordinarily stay home are going out. This was one of the most frequent comments I heard from players. People who would be sitting in front of their computers or TVs on a summer evening were at Reston Town Center instead. “Some people say this game is just another excuse to be on the phone, but it gets us out of the house,” said a 14-year-old named Ryan. Jannis Ernst, age 18, and his friends agreed. “If you’re going to be looking at a screen, you might as well be outside,” Jannis said. When I asked David Oakes why he enjoys playing the game with his 6-year-old daughter, he answered, “Because we’re outside. And walking.” He said that his daughter enjoys video games, but he prefers that she plays active ones. He’s pleased that Pokemon Go offers an active game that also motivates her to spend time outdoors. The game is giving people a lot of exercise. Pokemon Go is played outdoors by collecting virtual monsters and tokens at a variety of real-life locations. Some aspects of the game are enabled only after players walk specified distances. Seth Solomon, who had been playing the game for several hours that day, told me, “I’m normally at home, but today I’ve walked 12km.” A boy named Casra, who was celebrating his 11th birthday, told me that he walks about 5000 steps every time he plays. His 12-year-old friend, Jonah, told me,” I’m usually an inside person, watching TV, but as soon as I started playing this game I began walking around my neighborhood instead.” Perhaps most surprising was a 14-year-old named Duncan, who had walked almost 50km in four days. Renee Foote said that she isn’t usually interested in video games, but she downloaded Pokemon Go out of curiosity. “It’s addictive!” she said. Now the game motivates her to go further on her daily runs, since she now tries to catch Pokemon during her workouts. People are spending money while playing the game. “This is our third night out in a row,” Jennifer Toms told me, as she was eating ice cream with several members of her family at Pitango. They told me that they all had gone out on the town specifically to play Pokemon Go, with dinner at Clyde’s one day, dinner at Lake Anne the next day, and a dessert outing the third day. Many other people told me that they were going out to dinner with groups of friends while playing the game. 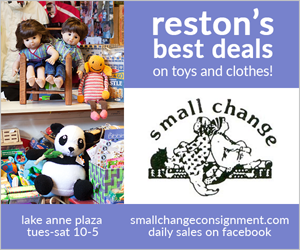 I even spoke to one guy who had been playing Pokemon at Reston Town Center the entire day, and had bought both lunch and dinner. Few of the players were carrying shopping bags as I chatted with them, but one family told me that they had stopped into a shop the previous day to buy emergency supplies — a back-up phone battery! Not everyone is into it. “I think it’s crazy,” Tahan Thraya told me as his niece stalked a virtual creature that was hovering near us. “It’s pointless, and everyone is walking around like zombies.” Doug Echols isn’t hooked on the game, but he’s supportive. “I had to learn how to play it for my wife. She hands me the phone and makes me do it when she’s driving.” Now that’s love. Many people think it’s going to be a short-lived trend. Pokemon Go is a free app for iPhone and Android. You can download it at the Apple Store or Google Play.